The space tourism company Virgin Galactic has put its spaceship of choice through new glide flights and re-entry technology tests in the latest round of workouts for the privately built spaceliner. The suborbital rocket ship SpaceShipTwo has been repeatedly dropped from its mothership, called WhiteKnightTwo, at high altitude during 10 glide flights at the Mojave Air and Space Port in California. It is the first of five SpaceShipTwo vehicles being constructed for Virgin Galactic by the Mojave-based company Scaled Composites. SpaceShipTwo is a six-passenger and two-pilot vehicle. Those flights, Virgin Galactic officials have said, will give paying passengers a stunning view of the Earth and several minutes of weightlessness. The price per seat? A cool $200,000. Virgin Galactic's spaceliner operations are bankrolled by British entrepreneur and adventurer Sir Richard Branson, who founded the firm. "Scaled has amassed a wealth of data and experience from the recent series of test flights which is now undergoing thorough analysis," Whitesides told SPACE.com. "Overall, the findings seem to be very positive. The team will soon enter a period of slightly less visible activity as they prepare the spaceship and carrier aircraft for the next phase of flight testing." Whitesides added that congratulations are due to the whole team at Scaled Composites for the dedication and hard work that has made so many flights possible in such a short time. The rocket plane made its maiden free flight on Oct. 10, 2010. Since then, it has been put through an ever-expanding set of flight objectives. At the Mojave Air and Space Port, the Scaled Composites team has been busy exploring the flight envelope of SpaceShipTwo, Whitesides added, pushing the vehicle to higher speeds and higher G-loads. Earlier this year, SpaceShipTwo passed a critical test flight: a demonstration of its novel re-entry system, which "feathers" the vehicle's aft flight surfaces to provide stability during atmospheric re-entry. "The feather was a major milestone," Whitesides said, with the glide flights exploring the aerodynamic envelope and seeing how plane reacts to pilot. 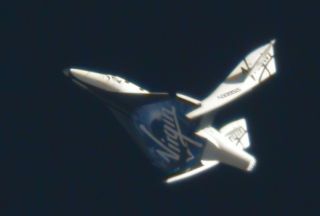 SpaceShipTwo’s ability to feather its tail section is a unique control feature. On a suborbital trek, SpaceShipTwo would boost itself upwards out of Earth's atmosphere to about 69 miles (110 kilometers), the vehicle’s maximum altitude. In re-entry mode, the tail structure of the craft will be rotated upward to about 65 degrees. In this feathered configuration, automatic control of attitude is achieved with the fuselage parallel to the horizon. This creates very high drag as the spacecraft descends through the upper regions of the atmosphere. At around 70,000 feet (21,336 meters), SpaceShipTwo's feather would lower to its original configuration. The unpowered spaceship then would glide to a spaceport runway and touchdown. The two feathered tests to date - though not done under all conditions that would be encountered during a full-blown plunge from space - matched predictions, Whitesides said. Regarding the mood of those working on SpaceShipTwo, "everybody wants to move forward as quickly as possible … while still being safe about it," Whitesides said. "There's a lot of satisfaction that they’ve built something that's basically a stable airframe. They are feeling pretty good so far." Whitesides said pilot proficiency is central to the SpaceShipTwo’s test card. "They’ve got a pretty deep bench of fantastic pilots," he said. Clearly, the integration of the hybrid motor with SpaceShipTwo is the next big milestone. That powerhouse engine is being crafted by Sierra Nevada Corporation. Short bursts to ever-long burns of the motor during flight are being planned. The first in-flight firing is still to be determined. "Realistically, probably around end of the year or early next year. We'll have to see how things go," Whitesides said. "Recently we conducted a firing of the motor which extended the burn duration by 30 percent and validated several of the important hardware systems," Sirangelo said. "We are preparing to shortly conduct another firing of the enhanced motor which will extend the burn duration and incorporate several additional important advances in the design. This firing is expected to lead to final design of the motors for flight testing," he explained. "Fascinating times," said Stuart Witt, general manager of the Mojave Air and Space Port. While more- aggressive testing of SpaceShipTwo is on tap, other space firms on the spaceport property ? including Masten Space Systems, XCOR Aerospace and Firestar Technologies ? continue to make progress, he added. "We are now operating seven days a week … continue to add well-paying jobs and work to capture additional projects seeking a risk-friendly location," Witt told SPACE.com. "We see nothing but exciting times ahead."